Now, I realize opinons about cooked cabbage may not be as enthusiastic as mine, but if you haven't had it in a while, try it again. Just cook until tender-crisp, not soggy. And understand, I grew up eating my share of German/Polish/Russian-inspired family cooking, so anything with cabbage is gonna be a hit. Sauteed with some Field Roast sausage (my favorite "faux sausage" in the world, but I suppose you may use whatever you like) and really, how can you go wrong? Sautee sausage slices with onion over med. heat until they start to brown. Add cabbage and apple. Cook, stirring frequently, until cabbage is done. Sprinkle with vinegar, salt and pepper to taste. You always make meals that are just a perfect fit for my tastebuds! This is EXACTLY something I would love to eat, it looks delicious. Cabbage and Field Roast makes me happy. Cooked cabbage is tasty! 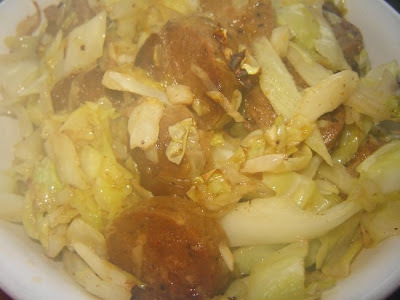 One of the best, most humble dinners ever is cabbage and onions sauteed until creamy, seasoned with salt, pepper, and paprika, and served with noodles. Yum! I'm thinking adding sausage to my version would be fantastic!!! Thanks for the idea! That looks so good! yummy..
yum! i need to make cabbage soon. i haven't had it in ages, and i've never had it fried! I LOVE cabbage and have been known to saute it by itself as a side dish. I bet it's amazing with seitan sausages.